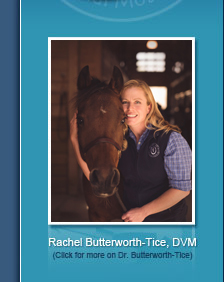 Dr. Rachel Butterworth-Tice Dr. Rachel Butterworth-Tice is the proud owner of Rutherford Large Animal Mobile Services, PLLC. Her goal is to provide professional, quality and personal care to the horses and farm animals of Rutherford and surrounding counties. She has a fully equipped mobile veterinary truck to come directly to the farm or you can bring your animal to the office for minor appointments (vaccinations, Coggins tests, basic exams). The office is located at 467 West Street in Spindale, NC. Please explore the website, if you have any questions, or suggestions please don't hesitate to contact Dr. Butterworth-Tice. Equine Dental Clinic - Join RLAMS at Bright's Creek for an Informative Equine Dentistry Clinic Saturday, February 21st. This educational clinic is not intended to teach the student how to perform equine Dentistry, as this can only be done in North Carolina by a licensed veterinarian. Click here to learn more about the clinic. Equine Wellness Program - The RLAMS Equine Wellness Program is designed to give you peace of mind, knowing your horse has the best preventative healthcare routine, at an affordable price. It eliminates the guesswork out of keeping up with your horse’s vaccinations, deworming and dental care. Three levels are available depending on your lifestyle and your horse’s needs. Copyright © 2014 Rutherford Large Animal Mobile Services, PLLC, unless specifically stated otherwise. Website created by ARCHON creative Design.